Experience and planning will keep your Field Day operation running smooth. 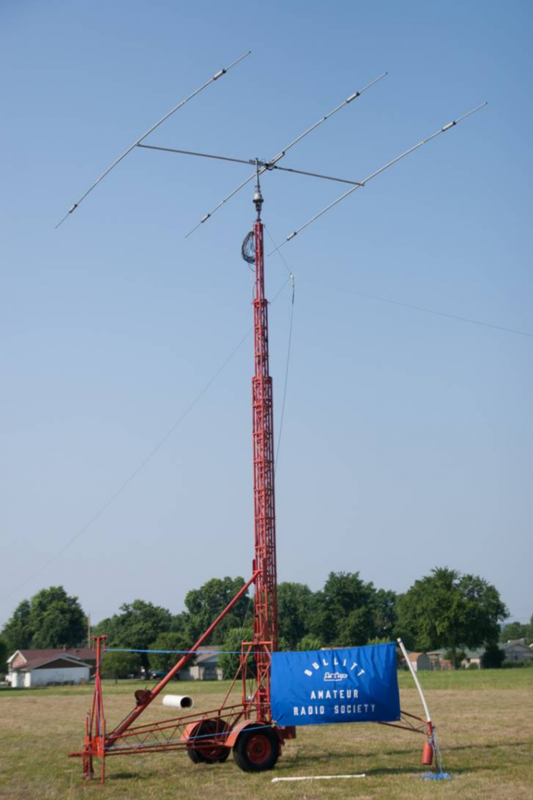 The annual ARRL® Field Day is touted as the largest disaster communications exercise in the world. Each year thousands of amateurs in North America working with clubs, a group of friends, or as individuals, take to the fields with thousands of dollars worth of equipment. But what does it take for this effort to be successful and stress free? In a word — planning! 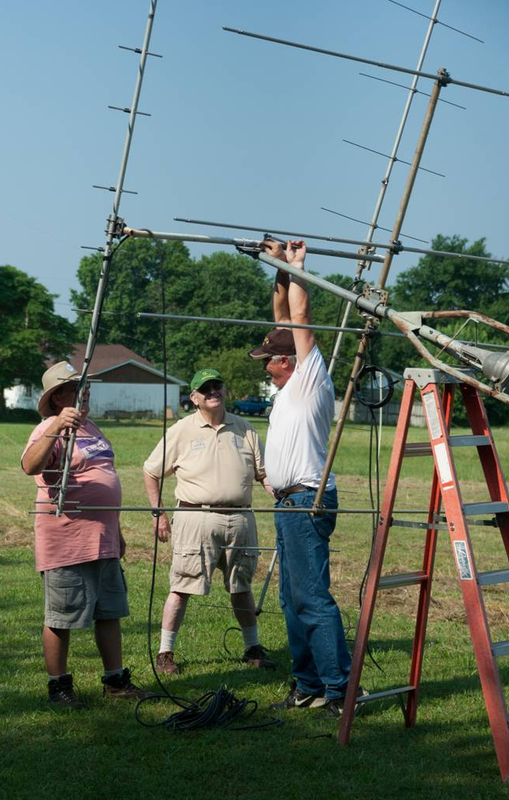 Over the years my club, the Bullitt Amateur Radio Society, has striven to improve on the previous year’s Field Day effort. In 2013, our operation was a testament to that planning. The club operates a 2F effort each year based out of the Pioneer Village, KY city hall. The city has been unbelievably supportive of Amateur Radio and our club in particular. They have, for over a decade, gone out of their way to make us feel at home, as we utilize their facilities for our monthly meetings and for the annual Field Day. Step One in an effective Field Day operation is having someone “in charge” to make sure things get done. 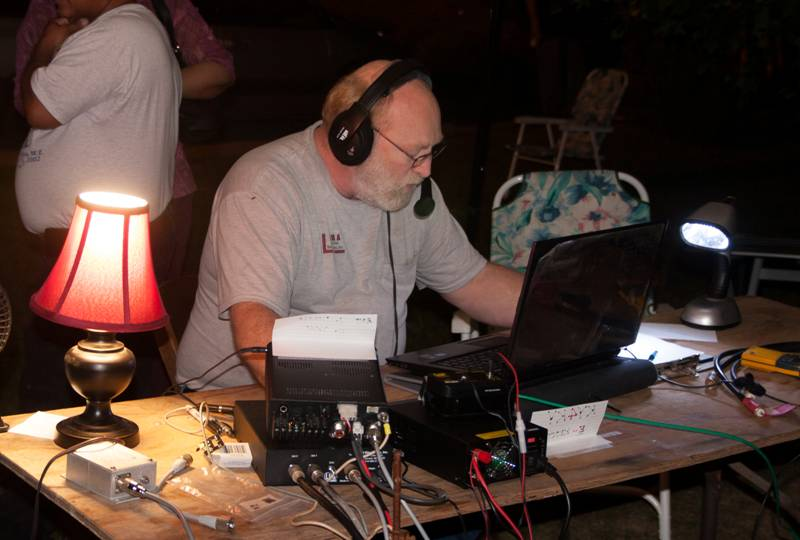 Rick, KC4S, has been our Field Day coordinator for several years now. He is organized and passionate about getting the job done. Your club or group doesn’t need someone to take on the whole job alone. You do need a person who is well organized and is willing and able to find the right people for each job. Step Two, in the perfect Field Day process, is to have a plan. The Bullitt ARS discusses Field Day 12 months out of the year. Our meeting programs focus on operating techniques and modes, antenna how-to, radio history, and other aspects of Amateur Radio. All this information comes together in our Field Day operation. Several months before Field Day weekend, the club ramps up our planning. Discussions focus on the operation. Do we want to increase our number of transmitters this year? Who can do satellites? How can we maximize our bonus points? What did we miss last year — and why? Don’t forget one of the most overlooked aspects of Field Day preparation — the exchange. Go over the exchange with the club. Give the operators examples of Dos and Don’ts. Stress keeping the information to a minimum. Don’t get chatty. After all, the reason is to exchange information quickly and effectively. Finally, consider the most important part of Field Day preparation — Saturday’s dinner menu. Remember Field Day is more than just a disaster exercise or a contest. It is also the social event of the year for your particular club or group, and good food makes for happy operators and higher scores. Step Three is most critical. Make definite arrangements with all FD operators defining who is going to bring what equipment to the operation — and have backups available in case of problems. One thing that Mr Murphy despises is a well prepared group. Most of the equipment for the Bullitt ARS effort is borrowed from club members for the 24 hour operation. The club owns a few antennas but not enough to complete a multitransmitter operation. In considering equipment, the simplicity of its operation is an important point. Most new radios have a learning curve to operate efficiently. If all the scheduled operators are familiar with that radio, then use the menu laden radio. However, if you have a mix of old timers and newbies, you will want to consider some of the less complex radios. I prefer knobs over menus for simplicities sake. Remember, the goal is to be able to communicate effectively and efficiently. Lastly, don’t forget the little things like short jumpers or barrel connectors. These small items can create big kinks in your planning and execution. Another point to consider is location, location, location. Not only can this secure you an easy 100 points, but snafus can arise if you didn’t ensure that your chosen location is available. Never assume. Always verify. Step Four is to secure operators for a 24 hour operation. Needless to say, there are usually a plethora of people available from 1800 until after Saturday’s dinner, but the night hours can be a bit sparse. 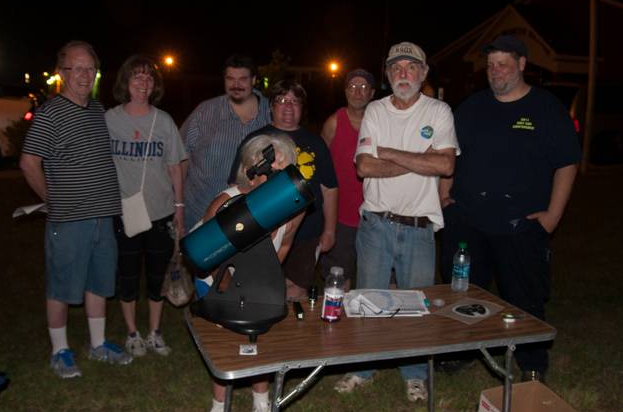 Over the years the Bullitt ARS has developed a dedicated group of all-nighters. A key to a big score is to have those transmitters going 24/7. In this part of the country, 40 and 80 meters are bread and butter bands after the sun goes down. Schedule an operator to man each of your stations for the overnight hours. Make certain that all your time slots are covered and get it written down and posted so everyone knows where they need to be and when. Stress the importance of commitment. If you sign up for the 1 – 3 AM time slot, be there. Step Five is to make certain that all the preplanning happens. This falls squarely on the shoulders of the Field Day coordinator and his delegates. Our FD coordinator has done a bang-up job over the last several years. He has maintained a checklist and checks off things as they happen. Got your satellite contact? Let the whole place know — bang, another 100 points in the book. 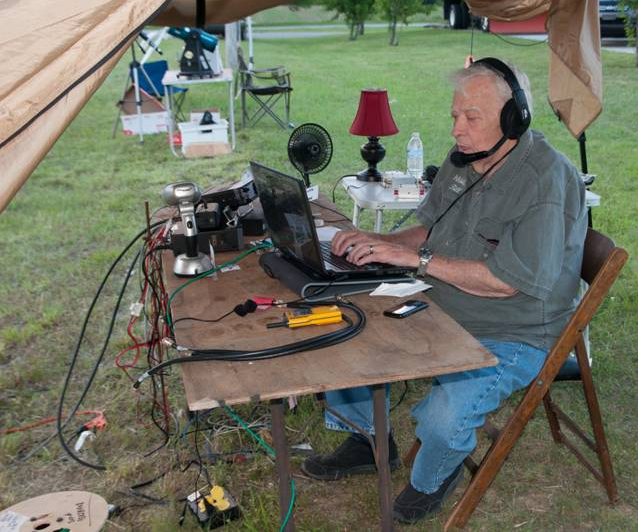 Get the ARRL Field Day message copied? Share the information to help keep the excitement high. Do so and the contact rate goes up. I know some big contest stations ring a bell every time a new multiplier is worked. Excitement does great things for your effort. Step Six is the finish and follow-up. 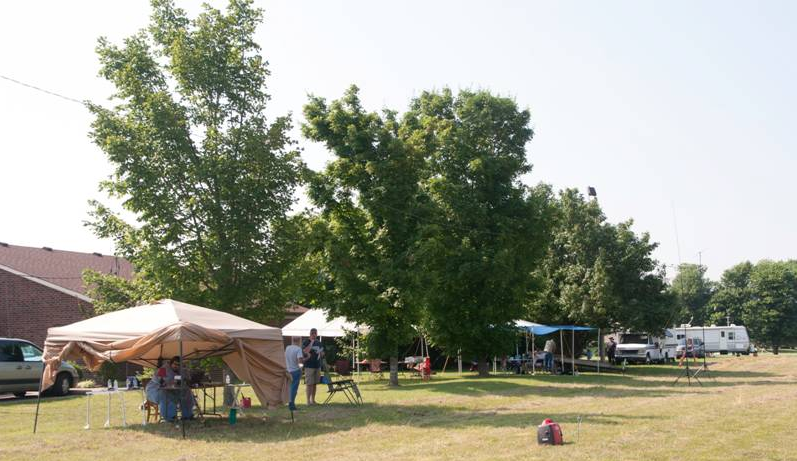 The Bullitt ARS was already discussing the next year’s effort before the first transmitter was shut down at FD 2013. Part of winding up last year’s FD was to discuss the deficiencies in the current operation and how to improve in 2014. Which antenna worked, which didn’t. Was a particular radio too difficult to use? Why? Document everything. If you change Field Day coordinators, the new guy needs to have a starting place. The more information your coordinator has the better job he or she will do. Step Seven is probably the most overlooked of all. Follow up with the outside groups that supported your Field Day effort. Drop a note to the local officials and media who visited your site with a word of thanks and your results. Such a note, coming right after the event, will build goodwill and make next year’s visit a bit easier to schedule. If your site was a public building, as ours is, it is especially important to send a note or drop by and visit the local officials who gave you permission. Let them know your results and thank them for their support. It doesn’t take a big effort to maintain goodwill, but neglecting to do so can easily result in misunderstandings or a feeling of being slighted. All of these steps are necessary for a successful and perfect Field Day effort. But the most important thing for a perfect Field Day experience is to have fun, don’t take yourself too seriously, and make the experience enjoyable for everyone who visits your Field Day site. This last note bears repeating — Field Day is also the day that we highlight and promote Amateur Radio to our neighbors, family, and friends. So make it a friendly and welcoming experience for those newly licensed guys and gals, and for those unlicensed people who drop by out of curiosity. Explain things in nontechnical ways. Invite a hands-on experience and make it fun. So was our 2013 Field Day experience perfect? Other than a couple of network issues and having to hunt up a couple of missing parts, it was planned to near perfection. We improved significantly over our previous year’s effort. Set up went more smoothly than any other in club history. It didn’t rain, but was one of the hottest on record — although the CW and VHF/UHF stations didn’t notice because their operating quarters were air conditioned. It’s always good to have members with RVs! Our Saturday meal was top-drawer and the cook was well praised and invited back for next year. Many new hams got their first taste of HF and new friendships were kindled. Was it perfect? No, but it was darn close. As a closing thought, Field Day is the highlight of most clubs operating year. To keep your club vibrant and exciting, your Field Day effort needs to be vibrant and exciting. A good Field Day coordinator goes a long way toward making that happen. But these positions change personnel, quite often annually. So to remain successful and approach perfection, train your replacement. Document what works and what didn’t and don’t leave out the why. See you June 28, 2014...... CQ FD. Buddy Sohl, KC4WQ, an ARRL Life Member, was first licensed in 1979 and holds an Amateur Extra class license. His primary activities are contesting, DXing and experimenting with digital modes. Buddy is a retired air traffic controller having been certified for both en route and terminal options. He retired from Louisville International Airport Traffic Control Tower in 2007. He was the main instructor for the first big project school in Kentucky, St Aloysius of Shepherdsville, until the school closed in 2011. Buddy can be reached via e-mail at kc4wq@arrl.net.